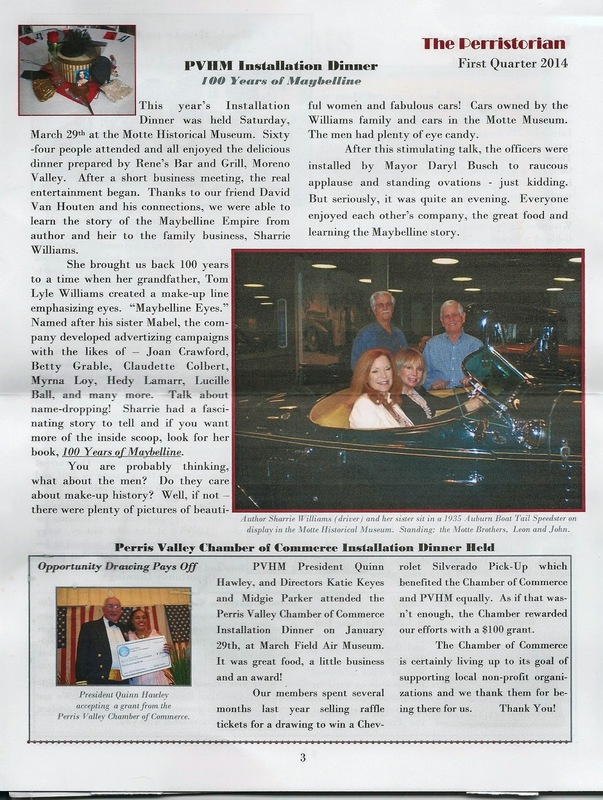 Valley Historical Museum and Perris Mayor Daryl Busch. 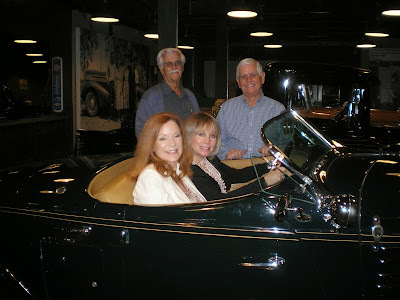 at the Motte Classic Car Museum. 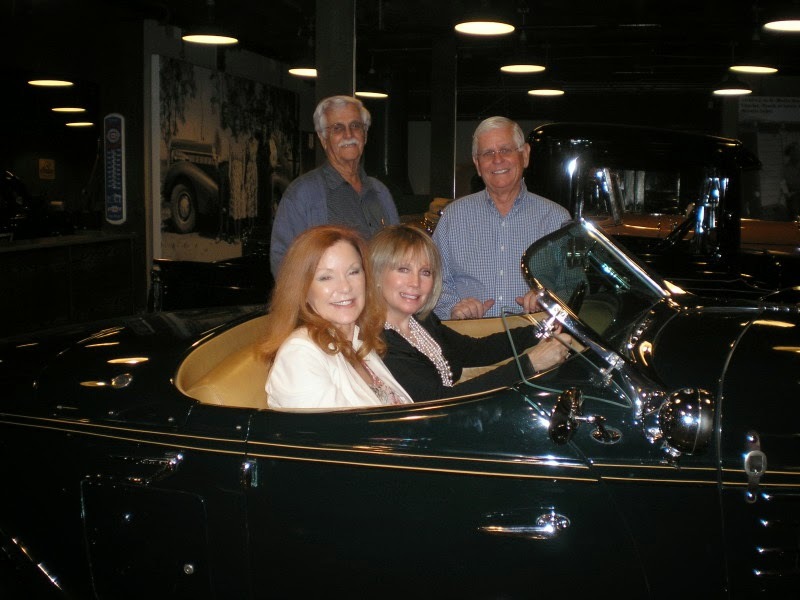 Leon and John Motte owners of the Motte Classic Car Museum pictured here with author, Sharrie Williams and her long time friend, Cheryl Manbeck seated in a classic Auburn. 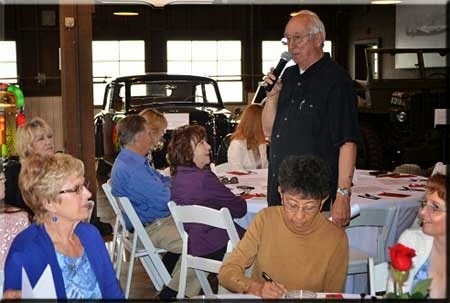 the Perris Valley Historical and Museum Association, addresses the crowd during the March 29 installation event. Sharrie Williams with her friend, David (Hook) Van Houten, long time filmmaker and Producer of Borderline Hollywood. 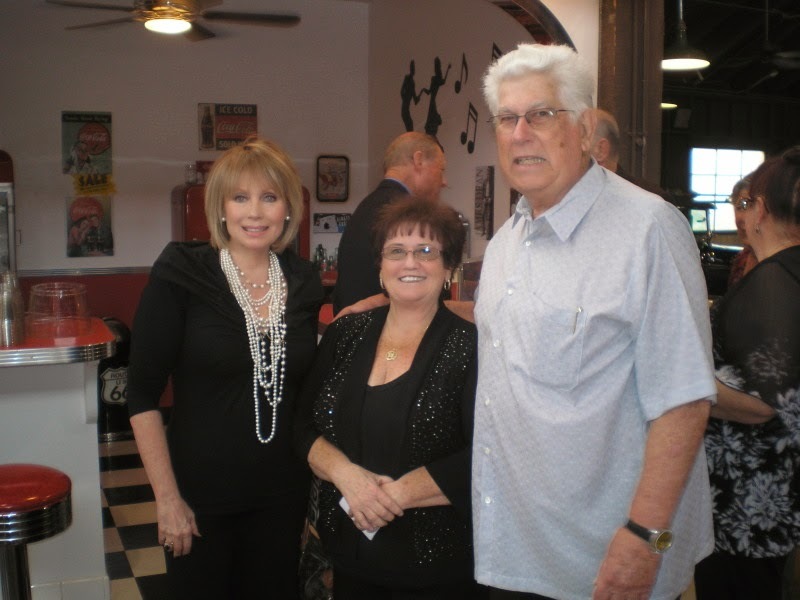 David Van Houten's roots in Perris date back to the 1800's, when Perris was home to the regions gold rush...the Hook family still own the Santa Rosa Gold Mine. David is deeply revered by the people in Perris and produced the movie, “D Street: A 45 minute Documentary” that captures a century’s worth of Perris history, culture, diversity, development and recreational activities and opportunities. 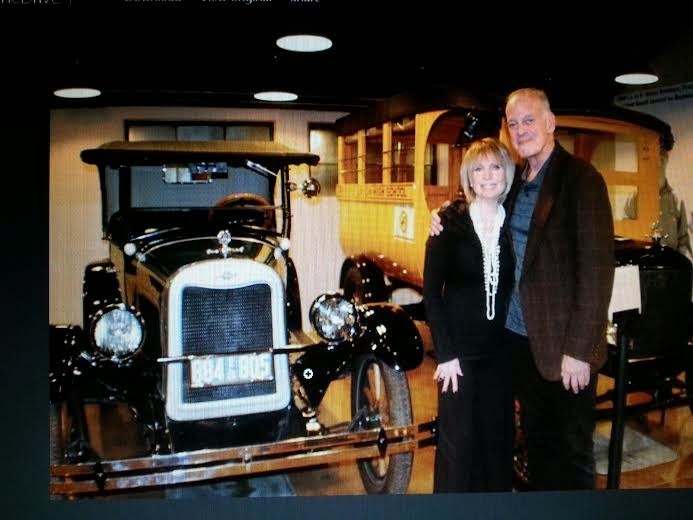 He has also donated much of his family's heirlooms and personal history to the Perris Historical Museum. Seated at my table were many of my friends and family. Left to right, Floyd Welles, Preston Williams, Patty Welles, David Van Houten, Billee Williams, Donna Williams, Sharrie Williams and Cheryl Manbeck. 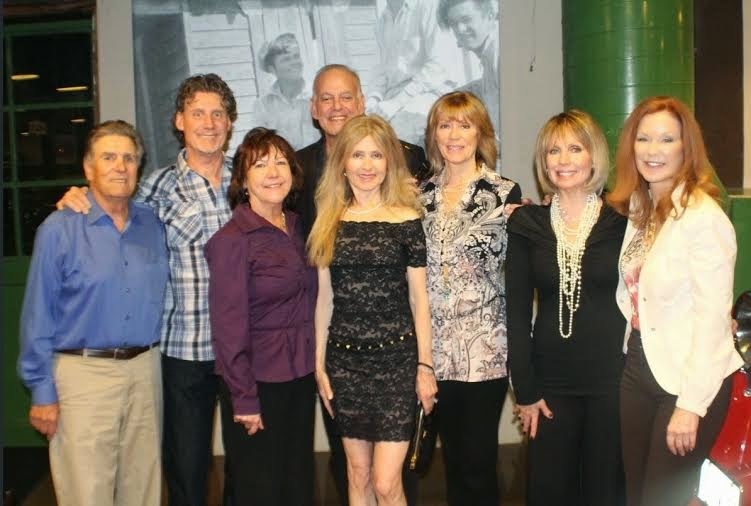 If you couldn't make it to this wonderful event, please enjoy the experience in this video. 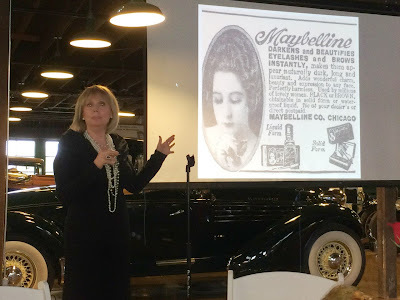 I was delighted to meet Riverside County supervisor Maroin Ashley at the my 100 years of Maybelline event and was very excited to hear that in late 2015 a new railway stop will be stationed in Perris. It will extend the existing 91 Line, which runs from Los Angeles Union Station to Fullerton, Corona and Riverside. According to Perris Mayor Daryl Busch, who also sits on the commission, there will be a new train station in downtown Perris. I will be the first to get my Passport to Perris and catch the train when it makes it's first stop at the Perris train station.... Finally after 100 years since Perris was part of Gold fever, it will be back on the map. Watch out people, because property values are going to skyrocket in the next ten years if things go the way they are for the "Little Train That Could." The creators of the Perris Centennial Exhibit at the Southern California Fair said they wanted to design a display that would link the City's past with present while connecting with people through a series of photographs, documents and mementos from Perris' first 100 years. What started as small and family-owned business went on to become one of the largest and well-known cosmetic giant in United States. The Maybelline story set's trends from the sidewalk to the catwalk, bestowing their love for fashion and dynamic colors in the lives of women all over the globe, They have empowered women to create new looks, make a glorifying statement, flaunt their individuality and showcase their creativity. The Maybelline family has always inspired women to feel beautiful and worthy of admiration. Motivated and inspired by established women, Maybelline provides a revolutionary and trendsetting palette of shades that are viable for every woman irrespective of color, creed and ethnicity. Sharrie Williams Blog... The Maybelline Book at www.maybellinebook.com has registered more than 3 million people from Germany, United States, United Kingdom, Russia, Ukraine and other nations. She has spoken to various online and print fashion magazines.